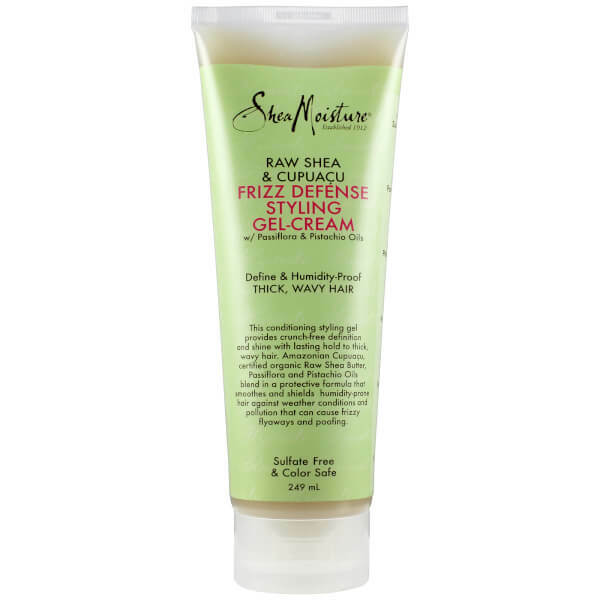 Catering specifically for wavy, thick hair, Shea Moisture's Raw Shea & Cupuacu Frizz Defense Gel Cream delivers texture and definition with long-lasting hold. Infused with Amazonian Cupuacu Butter, Pistachio Oil and certified organic Raw Shea Butter, the humidity-proof formula conditions and hydrates hair, whilst allowing you to create your desired style without stiffness or residue. Guards hair from weather conditions, pollution and frizz for a salon-worthy finish. Section clean, conditioned hair. 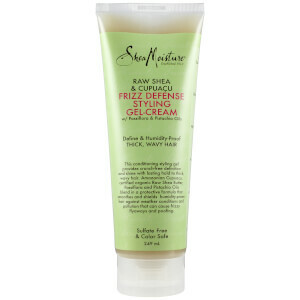 Apply a small amount to wet or damp hair, using fingers to work through each section. Air-dry for smooth, natural waves or heat style as desired. Water, Magnesium Aluminum Silicate, Butyrospermum Parkii (Shea) Butter*#, Mentha Piperita (Peppermint) Leaf Extract, Pistacia Vera (Pistachio) Seed Oil, Theobroma Grandiflorum Seed Butter, Passiflora Incarnata Flower Extract, Xanthan Gum, Glycerin Caprylyl Glycol, Caprylhydroxamic Acid, Sodium Phytate, Fragrance (Essential Oil Blend). *Certified Organic Ingredient. #Fair Trade Ingredient.